(Updated June 9, 2016) The Civil Service Commission(CSC) released results of April 17, 2016 Civil Service Exam - Paper and Pencil Test (CSE-PPT) also known as Career service examination for Professional and sub-professional levels on Thursday, May 26. The full list of passers out of more than 220,000 registered examinees are available here as we update this webpage. 25,276 examinees or 11.02% passed the Career Service Exam (CSE) conducted nationwide. 22,041 shall be conferred the civil service Professional eligibility, while the 3,235 of the successful examinees shall receive Sub-professional eligibility. The three-hour test for the professional level includes vocabulary, grammar and correct usage, paragraph organization, reading comprehension, analogy, logic, and numerical reasoning (English and Filipino). For the sub-professional level, exam coverage is almost the same with the inclusion of clerical operations instead of analogy and logic and timed for 2.5 hours. Both examination levels also include questions for general information on the Philippine Constitution, the Code of Conduct and Ethical Standards for Public Officials and Employees (R.A. 6713), peace and human rights issues and concepts, and environment management and protection. The CSC announced that exam results will be released within 41 days after the examination through posting the list of passers in the CSC website. Official results can be expected from May 23 to June 3, 2016 or on May 28 (41 calendar days). On May 3, 2015 exam, results became available online on June 12 for Sub-professional level and on June 15 for the Professional level (equivalent to 40-43 calendar days) after the day of exam. Meanwhile, results of April 6, 2014 exam were released on May 19, 2014 or in 26 workings days (equivalent to 43 calendar days). Examinees can also generate their examination rating through OCSERGS or Online Service Examination Result Generation System which can be accessed at the CSC website. Generation of exam rating through OCSERGS shall be available approximately in 15 days after posting the list of passers. 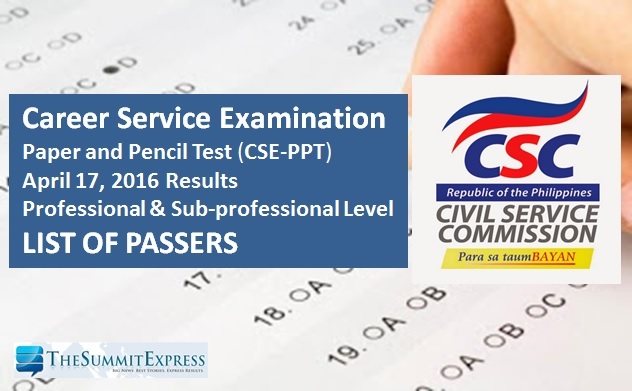 To receive more reliable updates regarding Civil Service Exam (CSE)-PPT, we encourage you to bookmark this page and don't forget to Like Us on Facebook or follow us on Twitter. You may also subscribe to our E-Mail list delivered by Feedburner.